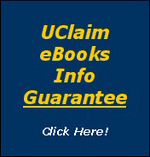 UCLAIM - Insurance Claim Advice and Help eBOOKS - GUARANTEED! Handling your own insurance claim, but looking for advice and help to maximize your insurance claims settlement? Was your insurance claim denied and you want it covered? UClaim 'Do-it-Yourself' eBooks have the insurance claims advice and help you need to understand how to get the most money from your auto, home and business insurance claims. UClaim eBooks answer common insurance claims questions and give insurance claims advice and help for many claim damage types, including fire, wind, waterflood, theft and collision. And if you need to know about insurance claims law, UClaim can help you.